Myoglobin is the primary oxygen-carrying pigment of muscle tissues. High concentrations of myoglobin in muscle cells allow organisms to hold their breath for a longer period of time. Diving mammals such as whales and seals have muscles with particularly high abundance of myoglobin. Myoglobin is found in Type I muscle, Type II A and Type II B, but most texts consider myoglobin not to be found in smooth muscle. 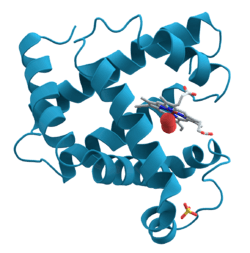 Myoglobin was the first protein to have its three-dimensional structure revealed by X-ray crystallography. This achievement was reported in 1958 by John Kendrew and associates. For this discovery, John Kendrew shared the 1962 Nobel Prize in chemistry with Max Perutz. Despite being one of the most studied proteins in biology, its physiological function is not yet conclusively established: mice genetically engineered to lack myoglobin are viable, but showed a 30% reduction in volume of blood being pumped by the heart during a contraction. They adapted to this deficiency through natural reactions to inadequate oxygen supply (hypoxia) and a widening of blood vessels (vasodilation). In humans myoglobin is encoded by the MB gene. As hemoglobin can take the forms of oxyhemoglobin (HbO2), carboxyhemoglobin (HbCO), and methemoglobin (met-Hb), so can myoglobin take the forms of oxymyoglobin (MbO2), carboxymyoglobin (MbCO), and metmyoglobin (met-Mb). Myoglobin is similar to hemoglobin in that it is involved in the transportation of oxygen to cells. There are many distinct differences that set the protein apart from hemoglobin. For one the protein has only one binding site for oxygen on the one heme group on the protein. While myoglobin can only hold one oxygen, the affinity for that oxygen is very high compared to hemoglobin. This is probably because hemoglobin, transporting 4 oxygens to the tissues and muscles where myoglobin is mostly present. The myoglobin takes the oxygen from the hemoglobin (due to the Bohr Effect) and takes that oxygen to muscle cells for use in metabolic processes. Myoglobin contains hemes, pigments responsible for the color of red meat. The color that meat takes is partly determined by the degree of oxidation of the myoglobin. In fresh meat the iron atom is the ferrous (+2) oxidation state bound to an oxygen molecule (O2). Meat cooked well done is brown because the iron atom is now in the ferric (+3) oxidation state, having lost an electron. If meat has been exposed to nitrites, it will remain pink because the iron atom is bound to NO, nitric oxide (true of, e.g., corned beef or cured hams). Grilled meats can also take on a pink "smoke ring" that comes from the iron binding to a molecule of carbon monoxide. Raw meat packed in a carbon monoxide atmosphere also shows this same pink "smoke ring" due to the same principles. Notably, the surface of this raw meat also displays the pink color, which is usually associated in consumers' minds with fresh meat. This artificially induced pink color can persist, reportedly up to one year. Hormel and Cargill are both reported to use this meat-packing process, and meat treated this way has been in the consumer market since 2003. Myoglobin is released from damaged muscle tissue (rhabdomyolysis), which has very high concentrations of myoglobin. The released myoglobin is filtered by the kidneys but is toxic to the renal tubular epithelium and so may cause acute kidney injury. It is not the myoglobin itself that is toxic (it is a protoxin) but the ferrihemate portion that is dissociated from myoglobin in acidic environments (e.g., acidic urine, lysosomes). Myoglobin is a sensitive marker for muscle injury, making it a potential marker for heart attack in patients with chest pain. However, elevated myoglobin has low specificity for acute myocardial infarction (AMI) and thus CK-MB, cardiac Troponin, ECG, and clinical signs should be taken into account to make the diagnosis. Molecular orbital description of Fe-O2 interaction in myoglobin. Myoglobin belongs to the globin superfamily of proteins, and as with other globins, consists of eight alpha helices connected by loops. Human globin contains 154 amino acids. Myoglobin contains a porphyrin ring with an iron at its center. A proximal histidine group (His-94) is attached directly to iron, and a distal histidine group (His-65) hovers near the opposite face. 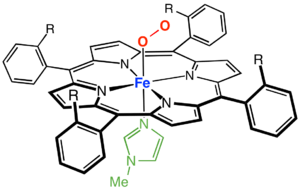 The distal imidazole is not bonded to the iron but is available to interact with the substrate O2. This interaction encourages the binding of O2, but not carbon monoxide (CO), which still binds about 240× more strongly than O2. The binding of O2 causes substantial structural change at the Fe center, which shrinks in radius and moves into the center of N4 pocket. O2-binding induces "spin-pairing": the five-coordinate ferrous deoxy form is high spin and the six coordinate oxy form is low spin and diamagnetic. Many models of myoglobin have been synthesized as part of a broad interest in transition metal dioxygen complexes. A well known example is the picket fence porphyrin, which consists of a ferrous complex of a sterically bulky derivative of tetraphenylporphyrin. In the presence of an imidazole ligand, this ferrous complex reversibly binds O2. The O2 substrate adopts a bent geometry, occupying the sixth position of the iron center. A key property of this model is the slow formation of the μ-oxo dimer, which is an inactive diferric state. In nature, such deactivation pathways are suppressed by protein matrix that prevents close approach of the Fe-porphyrin assemblies. A picket-fence porphyrin complex of Fe, with axial coordination sites occupied by methylimidazole (green) and dioxygen. The R groups flank the O2-binding site. ↑ Ordway GA, Garry DJ (Sep 2004). "Myoglobin: an essential hemoprotein in striated muscle". The Journal of Experimental Biology. 207 (Pt 20): 3441–6. doi:10.1242/jeb.01172. PMID 15339940. ↑ Kendrew JC, Bodo G, Dintzis HM, Parrish RG, Wyckoff H, Phillips DC (Mar 1958). "A three-dimensional model of the myoglobin molecule obtained by x-ray analysis". Nature. 181 (4610): 662–6. Bibcode:1958Natur.181..662K. doi:10.1038/181662a0. PMID 13517261. ↑ Mammen PP, Kanatous SB, Yuhanna IS, Shaul PW, Garry MG, Balaban RS, Garry DJ (Nov 2003). "Hypoxia-induced left ventricular dysfunction in myoglobin-deficient mice". American Journal of Physiology. Heart and Circulatory Physiology. 285 (5): H2132–41. doi:10.1152/ajpheart.00147.2003. PMID 12881221. ↑ Akaboshi E (1985). "Cloning of the human myoglobin gene". Gene. 33 (3): 241–9. doi:10.1016/0378-1119(85)90231-8. PMID 2989088. ↑ McGee H (2004). On Food and Cooking: The Science and Lore of the Kitchen. New York: Scribner. p. 148. ISBN 0-684-80001-2. ↑ Fraqueza MJ, Barreto AS (Sep 2011). "Gas mixtures approach to improve turkey meat shelf life under modified atmosphere packaging: the effect of carbon monoxide". Poultry Science. 90 (9): 2076–84. doi:10.3382/ps.2011-01366. PMID 21844276. ↑ Associated Press (2007-10-30). "Meat companies defend use of carbon monoxide". Business. Minneapolis Star Tribune. ↑ Naka T, Jones D, Baldwin I, Fealy N, Bates S, Goehl H, Morgera S, Neumayer HH, Bellomo R (Apr 2005). "Myoglobin clearance by super high-flux hemofiltration in a case of severe rhabdomyolysis: a case report". Critical Care. 9 (2): R90–5. doi:10.1186/cc3034. PMC 1175920 . PMID 15774055. ↑ Weber M, Rau M, Madlener K, Elsaesser A, Bankovic D, Mitrovic V, Hamm C (Nov 2005). "Diagnostic utility of new immunoassays for the cardiac markers cTnI, myoglobin and CK-MB mass". Clinical Biochemistry. 38 (11): 1027–30. doi:10.1016/j.clinbiochem.2005.07.011. PMID 16125162. ↑ Drago RS (1980). "Free radical reactions of transition metal systems". Coordination Chemistry Reviews. 32 (2): 97–110. doi:10.1016/S0010-8545(00)80372-0. 1 2 Universal protein resource accession number P02144 at UniProt. ↑ Collman JP, Brauman JI, Halbert TR, Suslick KS (Oct 1976). "Nature of O2 and CO binding to metalloporphyrins and heme proteins". Proceedings of the National Academy of Sciences of the United States of America. 73 (10): 3333–7. Bibcode:1976PNAS...73.3333C. doi:10.1073/pnas.73.10.3333. PMC 431107 . PMID 1068445. ↑ Lippard SJ, Berg JM (1994). Principles of Bioinorganic Chemistry. Mill Valley, CA: University Science Books. ISBN 0-935702-73-3. Collman JP, Boulatov R, Sunderland CJ, Fu L (Feb 2004). "Functional analogues of cytochrome c oxidase, myoglobin, and hemoglobin". Chemical Reviews. 104 (2): 561–88. doi:10.1021/cr0206059. PMID 14871135. Reeder BJ, Svistunenko DA, Cooper CE, Wilson MT (Dec 2004). "The radical and redox chemistry of myoglobin and hemoglobin: from in vitro studies to human pathology". Antioxidants & Redox Signaling. 6 (6): 954–66. doi:10.1089/ars.2004.6.954. PMID 15548893. Schlieper G, Kim JH, Molojavyi A, Jacoby C, Laussmann T, Flögel U, Gödecke A, Schrader J (Apr 2004). "Adaptation of the myoglobin knockout mouse to hypoxic stress". American Journal of Physiology. Regulatory, Integrative and Comparative Physiology. 286 (4): R786–92. doi:10.1152/ajpregu.00043.2003. PMID 14656764. Takano T (Mar 1977). "Structure of myoglobin refined at 2-0 A resolution. II. Structure of deoxymyoglobin from sperm whale". Journal of Molecular Biology. 110 (3): 569–84. doi:10.1016/S0022-2836(77)80112-5. PMID 845960. Roy A, Sen S, Chakraborti AS (Feb 2004). "In vitro nonenzymatic glycation enhances the role of myoglobin as a source of oxidative stress". Free Radical Research. 38 (2): 139–46. doi:10.1080/10715160310001638038. PMID 15104207. Stewart JM, Blakely JA, Karpowicz PA, Kalanxhi E, Thatcher BJ, Martin BM (Mar 2004). "Unusually weak oxygen binding, physical properties, partial sequence, autoxidation rate and a potential phosphorylation site of beluga whale (Delphinapterus leucas) myoglobin". Comparative Biochemistry and Physiology B. 137 (3): 401–12. doi:10.1016/j.cbpc.2004.01.007. PMID 15050527. Wu G, Wainwright LM, Poole RK (2003). "Microbial globins". Advances in Microbial Physiology. Advances in Microbial Physiology. 47: 255–310. doi:10.1016/S0065-2911(03)47005-7. ISBN 9780120277476. PMID 14560666. Which Cut Is Older? (It's a Trick Question) New York Times, February 21, 2006 article regarding meat industry use of carbon monoxide to keep meat looking red. Stores React to Meat Reports New York Times, March 1, 2006 article on the use of carbon monoxide to make meat appear fresh. This article is issued from Wikipedia - version of the 11/16/2016. The text is available under the Creative Commons Attribution/Share Alike but additional terms may apply for the media files.